Our free delivery does not apply to individual items, only complete sound systems. Microphones – see Microphones here. $90 plain lectern, no mic, this price when hired with a sound system. Lighting, Staging, LCD Screens, Generators. Delivery – for individual items. $60 Delivery within 10km perimeter. $60 Collection within 10km perimeter. to process payments through the New Zealand online banking system. 1. The hirer is responsible for loss and damage of the equipment. 2. Replacement for lost equipment and repairs to damaged equipment is charged to the hirer. 3. The equipment is not insured by SoundWorks. Check your own business or home contents policy, you may or may not already be covered. 4. SoundWorks is not liable for any injury caused by or in any way related to the equipment hired. You are responsible to effect and maintain your own insurances for your event including but not limited to public liability and property damage insurance. 5. Hire fees remain ongoing and effective while the equipment is not available for hire to other clients. 6. Payment is due on delivery by cash or online. Payment within 7 days can be made by arrangement. Payment on the 20th of the month following the invoice date is only available to trade and approved clients by arrangement. 7. Late payments charged at 2.5% per month compounding, plus administrative expenses. 8. The prices listed in our quotes remain valid for 30 days from the date of the quote. 9. Quotes are an estimate only and based on information supplied. Additional equipment will be charged at current rates and labour will be charged at actual hours spent. 10. Delivery charges are an estimate only and final charges will be assessed after delivery. 11. 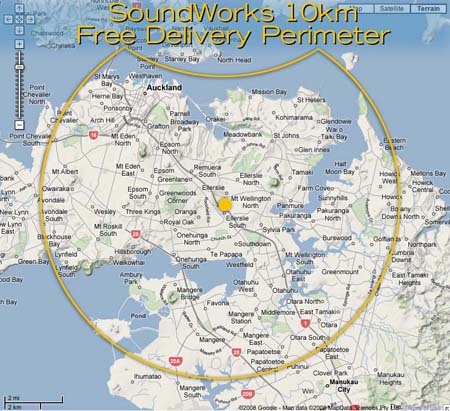 SoundWorks has a free delivery policy within our 10km Auckland perimeter centred at Ellerslie for Systems 1 to 7 as advertised on the website. Additional charges are applicable for further distances at $2 per km. See map. General notes about insurance concerns. Check you Business or Home Contents Poilicy – you may already be covered for equipment on your premises. Perhaps call your insurance company and get temporary cover, or ask the venue owners if hired equipment is insured under their contents policy. If cover is not possible, not available or too expensive, as is often the case, our advice is that the hirer should inform their management and staff that the person or company that hired the equipment from SoundWorks is taking full responsibility for the hired equipment. Common sense prevails; ask for and follow set-up and operating instructions, employ security, keep the public away from the equipment, or, hire experienced tech support to operate. To summarise; SoundWorks does not provide any insurance cover for you or for your event. SoundWorks is not liable for any injury caused by in any way related to the equipment hired. You are responsible to effect and maintain your own insurances for your event including but not limited to public liability and property damage insurance. Note: These provisions are standard, there are no sound hire companies in New Zealand who will automatically have their hire equipment fully insured when out on hire - it's just too expensive and would increase the hire costs off the radar! The hirer is responsible for all loss and damage of the equipment while on hire. Beware of the Noise Control Officers from the Auckland Council. If a member of the public complains about the sound levels at your event, you will get a visit from 'Noise Control' who will ask you to turn it down (ie: serve you an 'Excessive Noise Notice') if they also think it is too loud, sometimes they carry decibel meters. If a member of the public thinks you have not turned it down enough, Noise Control will come back, shut you down and take the gear away, they may also have the Police with them. If they do take the gear away there is a charge of about $350 plus our time at $55 an hour to retrive it from the Police. Hire charges continue until the equipment is returned to our depot. Having said that, don't be too concerned, SoundWorks has never had any equipment confiscated yet even though Noise Control have turned up at private events where we have supplied equipment. They have informed the event organisers there has been a complaint and they will request the sound is 'turned down', which is code for 'turning it off'. Most people are sensible enough to comply with the Noise Control Officers, and that's our advice. In brief; it's your responsibility. Contact numbers for more information: Duty Environmental Health Officer (09) 379 2021 x9073. Prices shown are for 1 days' hire, being up to 24 hours. The second day is charged at 50% of the one day hire rate. The third and ongoing days are charged at 25% of the one day hire rate, per day. A full weeks' hire of 7 days is charged as 3 times the one day rate. All 7 days of the week are chargeable – there are no weekend rates. Applies to events we are charging UNDER $1000. Cancellation up to 24 hours before we arrive on site to set up, no charge. Events outside Auckland; 36 hours. Cancellation 24 to 12 hours before we arrive on site to set up, 50% of full charge. Events outside Auckland; 36 to 24 hours. Cancellation less than 12 hours before we arrive on site to set up is 100% charge. Events outside Auckland; less than 24 hours. Applies to events we are charging OVER $1000. Cancellation over 7 days before we arrive on site to set up, no charge. Cancellation 7 to 3 days before we arrive on site to set up, 50% of full charge. Cancellation less than 3 days before we arrive on site to set up is 100% charge. 1.1 “Owner” shall mean AJR Productions Limited trading as SoundWorks and its successors and assigns. 1.2 “Hirer” shall mean the Hirer or any person or Owner acting on behalf of and with the authority of the Hirer. Where more than one Hirer has entered into this agreement, the Hirers shall be jointly and severally liable for all payments of the Price. 1.3 “Price” shall mean the cost of hiring the Equipment as agreed, between the Owner and the Hirer subject to Clause 9 of this contract. 1.4 “Equipment” shall mean that described on the lnvoice, hire forms or any other work commencement form including cables. 2.7 The Equipment is and will at all times remain the absolute property of the Owner. 2.2 lt is further agreed that; a) The Owner may give notice to the Hirer to return the Equipment. Upon such notice the rights of the Hirer to any interest in the equipment shall cease, b) lf the Hirer fails to return the Equipment to the Owner, then the Owner or the Owner’s agent may enter upon and into land and premises owned, occupied or used by the Hirer, or any premises as the invitee of the Hirer, where the Equipment are situated and take possession of the Equipment, without being responsible for any damage thereby caused. 3.1 The Owner retains property of the Equipment nonetheless all risk for the Equipment passes to the Hirer on delivery. 3.2 The Hirer acknowledges that they are liable for any loss or damage to the equipment from the time of delivery until it is returned to the Owner. 3.3 The Hirer will insure, or self insure, the Owner’s interest in the Equipment against physical loss or damage including, but not limited to, the perils of accident, fire, theft and burglary and all other usual risks. Further the Hirer will not use the Equipment nor permit it to be used in such a manner as would permit an insurer to decline any claim. 4.1 The Hirer shall look after and maintain the Equipment in proper working order during the period of hire and return the Equipment, including all cables, manuals and accessories at the completion of the hire in proper working order. For travel, the Hirer shall ensure that the Equipment is carried on board as cabin baggage and NOT hold stored unless it is in a hard carry case. 4.2 The Hirer will protect the Equipment from theft, damage and user abuse and will immediately advise the Owner by telephone of any fault, damage or loss of the Equipment. ln the event of loss or damage through any cause the Hirer will indemnify the Owner for making good the damage. ln the event that, in the discretion of the Owner, the Equipment cannot be repaired, the Owner will be entitled to the market value of the Equipment at the time of the loss or damage. 4.3 The Hirer shall pay the market value of the Equipment that is for whatever reason not returned to the Owner. 4.4 The Hirer will keep the Equipment in their own possession and control and accept full responsibility for the safekeeping of the Equipment. 4.5 The Hirer will not alter, interfere with or modify the Equipment and will ensure that the Equipment is used in a proper manner and will follow the directions of the Owner in this regard. The Hirer will meet the reasonable costs of repair of the Equipment where repair is due to a breach by the Hirer of the Hirer’s obligations in the agreement. The Owner gives no warranty as to the fitness or suitability of the Equipment for any particular purpose. 4.6 The Hirer will ensure that all persons operating the Equipment are suitable instructed in safe and proper use, and comply with all occupational health and safety laws relating to the Equipment and its operation. 5.1 The Owner shall not be liable in any circumstances, including any failure or alleged failure by the Owner to carry out its obligations under this agreement for any loss or damage (including consequential loss and loss of profits), arising directly or indirectly from the breakdown or failure of the Equipment or any part of the Equipment, or from the use, installation, removal or repair of the Equipment. 5.2 The Hirer will indemnify the Owner for any loss, damages or costs occurring or suffered consequent upon the use, installation, removal or repair of the Equipment or otherwise. 6.1 The Owner will use reasonable endeavours to deliver the goods/render the service on the date required by the Hirer. However, if the Owner fails to deliver the goods/render the service on the date required, the Owner shall not be liable to the Hirer for any loss (including consequential loss and loss of profit) that the Hirer should suffer. 6.2 On termination of the hire period, the Hirer shall return the Equipment in terms of Clause 4 back to the Owner. 6.3 Delivery of the Equipment to a carrier, either named by the Hirer or failing such naming to a carrier at the discretion of the Owner for the purpose of transmission to the Hirer, is deemed to be a delivery of the Equipment to the Hirer. 6.4 The failure of the Owner to deliver shall not entitle either party to treat this contract as repudiated. 6.5 The Owner shall not be liable for any loss or damage whatever due to failure by the Owner to deliver the Equipment (or any of them) promptly or at all. The Owner may terminate the hire and repossess the Equipment at any time during the period of hire without notice and without payment of compensation, and for such purposes the Owner may enter personally or by his or her agents at all reasonable times upon any premises where the Equipment may be kept. The Hirer shall be responsible for free access by the Owner to the site that the Equipment is located for the purpose of repair or repossession of the Equipment. lf there are any delays due to free access not being available then the Hirer shall be responsible and shall reimburse the Hirer for all lost hire fees associated with the Equipment being unavailable. The Hirer shall also be responsible for all other expenses and costs incurred by the Owner due to delays in access to the Equipment. 8.1 The Hirer authorizes the Owner to collect, retain and use any information or images about the Hirer, for the purpose of assessing the Hirers creditworthiness or for marketing any Equipment and Services provided by the Owner to any other party. 8.3 Where the Hirer is a natural person the authorities under (Clauses 8.1 & 8.2) are authorities or consents for the purposes of the Privacy Act 1993. 9.1 Payment is to be made in full within 7 days of receipt of lnvoice. 9.2 At the Owners sole discretion a deposit or full payment in advance may be required. The deposit amount or full payment will be stipulated at the time of the order and shall become immediately due and payable. 9.3 Payment of Invoice for any period over 7 days can only be made by arrangement between the Owner and The Hirer in writing. 9.4 Late payment fees at the discretion of the Owner commence 7 days after receipt of lnvoice by the Hirer. 9.5 Late payment fees are charged at 2.5% per month compounding. Administrative expenses at the discretion of the Owner may be charged for time incurred handling overdue payment issues. 9.6 Overdue invoices are passed on to a debt collection agent acting on the Owners instructions of which the costs incurred by the Owner to retrieve the debt are charged to the Hirer. In the event that the Hirer wishes to extend the period of hire, the Hirer shall request an extension of the hire period by telephone from the Owner at least 4 hours before the initial hire period expires. The Owner cannot guarantee an extension of the hire period however, every effort will be made to accommodate the Hirer’s requirements. Unless arrangements for the extension of the hire period have been made according to the terms of this agreement, first day rates will be charged. 11.1 The Owner may cancel these terms and conditions or may terminate the Hire of Equipment at any time before the Equipment is due for return by the Hirer by giving written notice. On giving such notice the Owner shall promptly repay to the Hirer any sums paid in respect of the Price for the Equipment. The Owner shall not be liable for any loss or damage whatsoever arising from such cancellation. 12.1 This agreement is subject in all cases except where the Hirer is contracting within the terms of a trade/business (which cases are specifically excluded), to the provisions of the Consumer Guarantees Act 1993. 13.1 The Hirer shall be liable to the Owner for any loss or damage suffered by the Owner as a result of any breach of, or non-performance of any of the terms of this agreement by the Hirer. 13.2 The Owner shall be under no liability whatever to the Hirer for any consequential loss and/or expense (including loss of profit) suffered by the Hirer arising out of a breach by the Owner of these Terms and Conditions. 13.3 In the event of any breach of this contract by the Owner the remedies of the Hirer shall be limited to damages. Under no circumstances shall the liability of the Owner exceed the price of the Equipment. 13.4 In the event the equipment is confiscated by Auckland City Council Noise Control Officers, a retrieval fee is payable and charges are ongoing while the equipment is not available for hire to other clients.